Niklas Luhmann, who died in 1998 (see Obituary in RP 94), is not widely discussed by social and cultural theorists outside Germany, Switzerland, Austria, Scandinavia and Italy. Yet in Germany his inﬂuence rivals and even exceeds that of Habermas in certain reaches of social theory, extending also to philosophers and logicians. More surprisingly, perhaps, he is a pervasive presence in the writing and conversation of art theorists and artists. Surprising, because Luhmannʼs loci classici are to be found in cybernetics, communications theory and the calculus of the British mathematician George Spencer-Brown. Luhmannʼs is a sociological systems theory. One might indeed think that he proposes a systems-theoretical approach to the entire range of geisteswissenschaftlichen products. And systems-theoretical approaches have stirred up the humanities more or less since the former have borne the name. Luhmannʼs argument, however, is that his critics are wrong: this theory is not another attempt at a nerdy putsch by technocratic imperialists, but an investigation of communication rather than agents and actions. And while he thinks that communication (which he conceives operationally) is somewhat improbable, he suggests that it is the very stuff that is transformed into social structures. and explained that ʻthere were many parallels between Luhmannʼs theory of autopoietic systems and the artistic practice (of reﬂection) of Art & Languageʼ. These were not conventionally academic conferences, in so far as they were both accompanied by exhibitions of Art & Language work. Indeed, the ﬁrst conference took place in the same room as the exhibition. 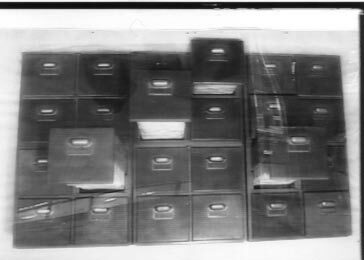 At the second, a facsimile of Luhmannʼs Zettelkasten (cardﬁle system) was exhibited in juxtaposition to Art & Languageʼs Index 01 of 1972 – ﬁling cabinets of Art & Language writings and fragments of writings indexed by a set of three relations. We left both occasions with a solid sense of working camaraderie, even though a good deal of the Luhmann talk was opaque to us. This is how we came to read some of his work. For ourselves, we can say that Luhmann writes from a world in which we do our work – or rather from within a world in which we can recognize ourselves as doing our work. While his is a ʻsocial theoryʼ, it will present difﬁculties to and bring disappointments to the conﬁdent professionals of the Social History of Art. It will be even more of an irritant to the academy of Cultural Studies. Luhmannʼs sense of ʻthe social systemʼ – and certainly of art as a social system* – is explained at a high level of abstraction in sometimes relentlessly technical language. It uses very few of the building materials which are normally used to construct the themes and motifs of ʻart and societyʼ, ʻthe social history of artʼ and (a fortiori) ʻthe art worldʼ. Art as he conceives it is an autopoietic system that knows a bit about the world which it must treat as its background. For him art is made of the communications within and presumably out of such a system. At the same time, art does not reduce to systems-theoretical formulae. It is the mystify* Niklas Luhmann, Art as a Social System, trans. Eva M. Knodt, Stanford University Press, Stanford, CA, 2000. 421 pp., £47.50 hb., £17.95 pb., 08047 3906 4 hb., 08047 3907 2 pb. All page references in the text, unless otherwise indicated, refer to this book.ing but unmystiﬁcatory remainder that interests him. ʻEven if it (art) employs text as an artistic medium its “communications” cannot be adequately rendered through words (let alone concepts).ʼ The upshot of all this is that artistic practice can resist meltdown into hopeless spectacle and manipulative barbarism in so far as it works hard on its own indeterminacy, its endless project of self-description. This is art without puriﬁcation or police. It is art borne of the practice of bad citizenship in the state controlled by the academy of Cultural Studies. Luhmann argues that systems of control and systems of power are intimately related and that cybernetics tells us that these can be deconstructed rather than merely opposed. The reasons of the parts of social systems are not the same as the reasons of the whole. They therefore have to be explained differently, and, furthermore, the whole is much more stupid than the parts. He agrees with Vico, Marx and Gramsci that social practice has (or rather can ﬁnd) no foundation outside itself. ʻCommunicationʼ in Luhmannʼs sense implies a great deal of modesty on the part of enquirers after human causes and effects. He has an answer for his critics of the Left and elsewhere who argue that it is a regime of technicalities which is of no value with regard to the pragmatics and semantics of real communication. ʻOKʼ, he argues, ʻit may look like a lot of engineering and other fraudulently value-free stuff, but in deﬁning a message as “one selected from a set of possible messages”, the communication theorists Shannon and Weaver were in fact saying something both provocative and useful.ʼ Moreover, Spencer-Brown, whose recasting of Boolean algebra as a ʻcalculusʼ departed from a non-engineering observation that engineers need to leave possibilities open, makes a connection that Shannon and Weaver leave out. For Spencer-Brown, a distinction signiﬁes – or at least makes sense – because it relates a marked space (a singling out) and an unmarked space which is a set of possibilities. Luhmannʼs theory of reference and his epistemology are thus ʻconstructivistʼ, in the sense that he regards reference as something made by differences – here differences between ʻmarked spacesʼ – not by perceiving agents or by appeal to the putative references themselves. Luhmann uses the term ʻobserverʼ in an odd and sometimes counter-intuitive way. This is connected to his interest in systems, and systems are what he wants to ʻobserveʼ. They are for him sets of possibilities which an actor puts herself in whenever she, or her actions, are about something. Systems are no more than the relation between an actor (agent) and something which is as it is and, furthermore, is what it is as a result of that relation. Luhmannʼs notion of autopoiesis originates in the work of Humberto Maturana, who uses the term to describe the recursive operations of self-referential systems. What distinguishes such organic systems from the classical mechanical ones is the recursivity of their operations. Everything that is the system is produced by the system. Autopoietic systems are, however, operationally closed and blind to their environment. They cannot create a world except in so far as world-making is a necessary correlate of the systemʼs own operations. Luhmann argues that the question ʻHow can operationally closed systems create openness?ʼ replaces the classical distinction between closed and open systems. The text itself is ʻnon-linearʼ – the fruit of Luhmannʼs use for research and writing of a Zettelkasten or card-ﬁle system. Things pop up in surprising or unpredictable places and in unusual proximities: the history of the relation between systems theory and the humanities meets literary criticism and more. ʻSystemʼ (as distinct from ʻsystems theoryʼ) is a term borrowed by philosophers in the early years of the seventeenth century from theologians. It became a name for a synoptic and comprehensive treatment of a philosophical discipline and eventually for such a treatment by any discipline whatsoever. But as early as 1749 Condillac pointed out that systems canʼt be better than the principles on which they are based. Philosophers can feign hypotheses. Scientists sign up to the Newtonian declaration ʻhypotheses non ﬁngoʼ. Thereʼs the point of difference. So much the worse or better (Condillac thought worse) for philosophical systems and so much the worse or better (Condillac thought better) for scientiﬁc ones. Are Luhmannʼs hypotheses feigned? It is not entirely clear. He shifts. The framework remains. And however his hypotheses are got, they are usually penetrating, a bit uncanny and mostly elegant. There are occasions when the various parameters of systematicity – simplicity, uniformity, comprehensiveness, and so on – get tangled and tense. The Zettelkasten-led apostrophes are perhaps how Luhmann owns up to and embraces that. At the same time, this possibility of tension within and between these various ʻdesiderataʼ of systematicity is what shows that the concept is itself a systems-directed one. If you donʼt buy the desiderata you donʼt buy the system and vice versa. The business of constructing systems since Kantʼs Critique of Pure Reason is architectonic. For Hegel and (many) neoHegelians, system was not just an important aspect but the essential characterizing feature of Wissen. Luhmann may be no systematizer in this sense. At the same time he can work at a level of abstraction such that the system Spencer-Brown-plus-Shannon-andWeaver-et-al. seems to go to all situations without the clear discrimination and the concreteness that, in the end, a good systemʼs theory should be able to provide. Often these contraptions work best small. How do you design a good shoe, car, house, etc.? And even in these small cases conﬂicts arise. Luhmannʼs system ﬁts the world where it touches. Is this a failing? It does touch art and it leaves a mark. Luhmann reformulates the social as consisting of communications. In this sense there are no agents and interests, only communications. His is a challenge to the determinants of modernityʼs self-descriptions. In drawing a number of decentring and deconstructive conclusions he draws many Quinean or Derridean consequences. The uniﬁed autonomous subject goes out, along with the idea of the social as a product of intersubjectivity, and the idea of language as the representation of the content of consciousness – with a given communication as the transmission of these contents. As with Derrida, these clearings-out begin with phenomenology. Meaning for Luhmann, however, is an effect of differences that make a difference. He uses systems theory to ʻrethinkʼ consciousness as a facing up to the implications of autopoietic closure. In his unfamiliar usage, communication can ʻobserveʼ consciousness but only from outside and from within the boundaries of what is marked by the observation. The communication system and consciousness can operate simultaneously without necessarily interfering with each other, since they both function autopoietically. Of course they can intersect and may indeed have developed in concert. In trying to help British Railways with a timetable machine (a truth-table maker) George Spencer-Brown developed a ʻcalculus of indicationsʼ. This is the linchpin of Luhmannʼs system. Here is, we are told, a ʻcalculusʼ that welcomes and deals with opacity and ambiguity. The ʻcalculusʼ involves an injunction: ʻdraw a distinctionʼ. The argument is that we canʼt make or do anything without drawing a distinction and, indeed, we do this endlessly. A distinction according to Spencer-Brown is not the same as the indication (pointing/marking/selecting) it makes, but it contains it. It also contains all the rest of the world that is not indicated. Indeed, the distinction is itself contained in this unmarked space. Luhmann argues that this ʻcalculusʼ is operational. It is supposed to refer to the concrete operations of ʻrealʼ (opacity-recognizing self-referential) systems. If we indicate, we indicate something, but the operation is not terminated by what the indicated something is. Each operation of indication results in some sort of referring, but there is a difference generated between that operation and what it marks, points to, selects or refers to. There is no necessary correspondence between, on the one hand, the difference between what is referred to and everything else and, on the other, what is ʻwithinʼ the operation of the system of distinguishing and what is outside it. Consider for example the (Brothers) Marx epigram, ʻTime ﬂies like an arrow, fruit ﬂies like a banana.ʼ We can distinguish ʻTime goes or proceeds as quickly as an arrowʼ (the ʻcorrectʼ reading) from ʻA certain species of ﬂies, time ﬂies, enjoy a bananaʼ (the ʻincorrectʼ reading); and ʻA certain species of ﬂies, fruit ﬂies, enjoy a bananaʼ (the ʻcorrectʼ reading) from ʻFruit goes or proceeds as quickly as an arrow doesʼ (the ʻincorrectʼ reading). This distinction/indication is not the same as indicating that time does indeed ﬂy like an arrow or that fruit ﬂies really do enjoy a banana. In a system, according to Luhmann, the two distinctions occur at the same time, and they develop together even though they are distinct. The autopoietic is thus something that recognizes an outside, an ʻenvironmentʼ, in which time goes as time goes and fruit ﬂies do as fruit ﬂies do, and is self-referential in distinguishing various possible readings of the two sentences and resolving the ambiguities involved. Neither of these operations is the same as getting the joke, which is brought on by another distinction. It would be hard to say if getting the joke would be a matter of external reference or self-reference. Relations of this kind are, nevertheless, what ʻformʼ implies for Luhmann. It should be clear by now that Art as a Social System is not a book which charts the transmission of soul contents as mediated by works of art. Here are some more things it is not: it is not a book of aesthetics seen or operated sociologically; it is not a study of the stratiﬁed society in which art has its being. Luhmannʼs is a sociology which lays claim to being its own (anti-) epistemology. He speaks of an ʻecologyʼ of knowledge, an ecology that, he argues, we have to learn to work if we are to deal adequately with the growing complexities of social differentiation. He gets rid of the model of society based on stratiﬁcation, not because he thinks there are no disﬁgurements, but because he thinks that such models lead to disenfranchising – or at least to confusing and misrepresenting – reiﬁcations and puriﬁcations which simply hide the colossal indeterminacies which all social thinkers confront. Causality, in social terms at least, is downgraded as a mediately operational distinction in a world that is massively underdetermined as well as overdetermined. In an article, ʻThe Paradox of Formʼ, Luhmann offers an illustration: in Paradise Lost, the angel Raphael explains history to Adam (i.e. the reader) as history goes on around them (ʻRaphael performs his message, reminds Adam of his state and of his enemy; relates at Adamʼs request who that enemy is and how he came to be so beginning from the ﬁrst revolt in Heaven and the occasion thereofʼ (Paradise Lost, Book V). History can only be understood within history. There are no Archimedean vantage points, as we all know. The problem, according to Luhmann, is ﬁnding a present so that ʻoperationsʼ are not mixed up with their past(s) or their future(s). Spencer-Brownʼs distinction between, on the one hand, the observable and the unobservable ʻﬂiesʼ as referring to a particular sort of action, versus, on the other, ʻﬂiesʼ as verb or noun, presupposes an ʻobserverʼ who deals with the difference and is compelled by it to refer back to herself. Luhmann thus attempts to dissolve the distinction between naturalism and anti-naturalism. As Roy Bhaskarʼs reluctant anti-naturalism avers, the best social science can do is emulate natural (i.e. experimental) science methodologically. Nature doesnʼt lie, and in the social sciences we shouldnʼt cheat. While Luhmannʼs writing has strangeness, it would be absurd to suggest that his is the sociological equivalent of the Copenhagen interpretation of quantum mechanics. (ʻThere is essentially the question of the inﬂuence on the very conditions that deﬁne the possible types of prediction regarding the future behaviour of the systemʼ – Niels Bohr.) Luhmann would admit from the outset that some of his hypotheses may be feigned. His is no more (which is in fact a lot) than an attempt to ﬁnd a way for the social sciences to live with a great deal of indeterminacy. There is, however, no danger to the sociological equivalent of Schrödingerʼs cat… well, of course, no equivalent could be imagined. In one of Luhmannʼs previous books, Observations on Modernity, he writes of the loss of that authority which he deﬁnes as ʻthe ability to represent the world and to convince others of the same representationʼ. This has been lost, he argues, ʻto something called the politics of understanding, where the latter are negotiated provisos that can be relied upon for a given time which do not represent reasonable nor even correct solutions to problems but simply ﬁx reference points for further controversies. Understandings have one big advantage over the claims of authority: they cannot be discredited but must be constantly negotiated.ʼ While this passage begins to account for Luhmannʼs sense of history within history and for his willingness to countenance paradox as useful, it also describes what itʼs like to read his text. The ʻsystemʼ always reveals something frustratingly contingent, such that you are reminded of things you almost thought about, or may have thought you thought about – or some further sense of modality. This is a strange and powerful effect. But take care. It is also a condition of a subjunctive conditionality: ʻIf I had thought that I would…ʼ – a sort of self-deception. Luhmann is quite capable of laconic robustness and he provides many illuminated readings of works of art in context – and this without browbeating the reader with his (extraordinary) Bildung. On the other hand, his more theoretical arguments are conducted so relentlessly, at such a high level of abstraction (this he admits), as to be entirely persuasive regarding the question of their adequatio intellectu. It is the ad rem bit that one occasionally struggles to recover (or is it vice versa?). Unlike those (postmodernist, etc.) theorists who exemplify their Spenglerian sense of epoch in a collapse into aporias, inversions, transgressions and provocations, Luhmann does not leave us entirely without bearings in a sea of endless pluralities. The ʻsystemʼ lets you peek at the map. It is sometimes hard, sometimes easy to see art of various forms, all manners of producing them, all interpretations and all judgements about them assimilable to moments in a highly ramiﬁed but abstract system. It is, for example, sometimes hard to ʻliveʼ both with Luhmann and with the materially founded sense of depression and loss which attends the barbarisms big and small of the art dealer and art dealerʼs world and of the artistic products it engenders. Luhmann nevertheless asks us to orient ourselves in a historical, sociological, artistic and moral space. This is hard work. It requires us to discriminate in circumstances where discrimination is often improbable. Reading Luhmann is operational reading. It constantly requires the discrimination of a system (peeking at the map which may be unreliable) from that systemʼs environment. This distinction has to be new, or has to be found operationally. There are things which we know we are attending to, but even as we do this there are other things to which we might, ought or should be attending. ʻFormʼ shows us that what we imagine as a clear cultural identity must face up to contingencies which infringe, overlap and deny that identity. A useful ﬁgure to keep in mind is one employed by Dirk Baecker in commenting on the inﬂuence of Husserl on Luhmann. The latter abhorred Husserlʼs idea of a ʻspirit of Europeʼ (which admittedly he may have been speaking of in post-Freiburgian desperation in Vienna in 1935). The spirit consists of rationality, worship of reason, enlightenment and the socially responsive human being. This spirit excludes the Roma. But according to Luhmann, the Roma people are the most sophisticated in accounting for boundaries. They cross them, they ʻde-constructʼ them. Watching the Roma will tell the observer more about the actual state of Europe than any digging for its spirit ever could. This support for ʻRoma reasonʼ is presumably part of ʻthe German experienceʼ – but, according to Baecker, Luhmann (alluding to Schiller) thought that those who preferred reason to the multiplicity and individuality of appearances were barbarians. He preferred ironical reason. (See Dirk Baecker ʻGypsy Reason: Niklas Luhmannʼs Sociological Enlightenmentʼ, in Cybernetics and Human Knowing, vol. 6, no. 3, 1999, p. 5. )Art as a Social System sits alongside other books in Luhmannʼs series: The Economy as a Social System; Science as a Social System; Law as a Social System. The sociological enlightenment of Luhmann is not the discovery or the establishment of a uniﬁed meaning of society. It is rather a kind of recursive systems theory – the doubling of the world into the visible and the invisible. Again, according to Dirk Baecker, ʻpeople can see what they see but they cannot see that they did not see what they did not seeʼ. Luhmannʼs writing seeks to emancipate contingencies and to emancipate with contingencies. This is something art can do. He is quite clear, however, that this will not continue to any purpose unless there is (soon) some sort of development in artistic culture such that artworks achieve some sort of internal complexity. He doesnʼt really say why. Hereʼs why: if they donʼt achieve this, then all works of art will become no more than the instrumental adjuncts of Murdoch-like curators. Art will simply be unable to put up a ﬁght. There are agents in the book, authors and so forth, but what they do qua social beings is not what agents do, but communications. These agents are the names attached to Luhmannʼs copious and wide-ranging references, but otherwise all the real action is with ʻobservationsʼ, ʻoperationsʼ, ʻeventsʼ, ʻstructural couplingsʼ and so forth. While Art as a Social System may be about what the title suggests, Luhmann operates an astonishing range of reconstructive and interpretative observations. Some of them, given his refreshing and exemplary distance from the art-worldy, art-historical academy, are established critical insights made strange and thus interesting. Here, for instance is Luhmann on the problem of Realism – though it takes a while to ﬁgure out that thatʼs what his nice recasting is addressed to. Ascertaining a ʻrealityʼ is based on an experience of a resistance in the system against itself – for example in perception against perception, or in language against language – and not on a comprehensive impression of the world. The being-in-the-world of the communication system emerges from a continual coupling of self-reference and hetero-reference. (pp. 10–11)And Luhmann is far from regarding art as some sort of sociological adjunct. He is aware of developments and complexities in modern art conceived as relatively autonomous, and he produces an informative reconstruction of the various conditions which made this autonomy both possible and necessary. He is never guilty of the typical philosopherʼs error of treating works of art as merely underdetermined cases, illustrations or exempliﬁcations of ontological or hermeneutical puzzles. He does not simply rely on dear old René Magritte, the philosopherʼs friend, to make the exemplary case with a game of unreﬂective but ʻparadoxicalʼ pictoriality. While the genetic character of Luhmannʼs systems-theoretical approach may replay the warning bells rung by Habermas or C. Wright-Mills, we have to remember that Barry Barnes (for example) is not so prejudiced as to be unwilling to use Talcott Parsons for what he is good for. Similarly, this social-systems theorist makes sense of Conceptual Art not as a historically purblind scandal of pickled sharks and unmade beds, nor as an occasion for postmodernistsʼ opportunism and spectacle, nor yet as the freeing of tendency from a formalist straitjacket, but as a quasi-fatal necessity driven by the historical and philosophical breakdown of previously sustainable (even self-sustaining) aesthetic systems. He understands what Conceptual Art thought it had to do: ʻUnder the conditions of autonomy, this means that art must surpass itself and eventually reﬂect upon its own surpassing of itself.ʼ There are few other remarks that capture the improbable requirements on a Conceptual Art of around 1968–70. Most observers bring either a disappointed sense of ʻtasteʼ or a disappointed sense of ʻmeaningʼ to it. Luhmann reminds us that there was a social and sociological dimension at work in Conceptual Art, rather than, as is usually assumed, just a ʻphilosophicalʼ one. But suppose we venture from a phenomenon-centred to an operative doctrine of perception, and from a representational to a constructive epistemology – the scientiﬁc system seems to force such a move. Would not the theory of art have to follow this paradigm shift and be based on radically different foundations? If perception and, even more so, conceptual thought are already constructed by the brain, then shouldnʼt art fulﬁl entirely different functions in shaping and utilizing the realm of free play generated in the process? The functional concepts of imitation and representation, now obsolete, would have to be rejected a second time – not because they unduly restrict the freedom of art, but because they indulge in, rather than unmask, the illusionism of the world… (p. 7)The idealism of this remark does not bother Luhmann unduly. It is not a programme which prevents him from recognizing that reality is often the rock against which experience is dashed. We might say that Bertrand Russellʼs no-doubt-apocryphal correspondent holds no horrors for Luhmann or for his ʻsystemʼ. Luhmann wouldnʼt laugh very loudly at those who assert ʻWe are solipsists and canʼt understand why everyone else isnʼt.ʼ He would suggest that they cope with the inconsistency and try to make good use of the irritability which the apparent paradox generates. The Zettelkasten continually shows in the text, which has occasionally the eerie aspect of snatches of ʻuncompletedʼ or uncompletable conversations. Do you read or browse? Luhmann neither hectors nor admonishes. His book makes no attempt aggressively to defend itself against derogations it clearly anticipates. As a consequence, it is remarkably resistant to the readerʼs critical or censorious efforts. We found ourselves thinking from time to time that we had unmasked a hidden apologetics – a certain bourgeois Dasein. Such a possibility haunts oneʼs reading of the text. Luhmann doesnʼt hide from this and suggests how it might be recognized as the product of prejudice, or made into useful paradox. The strength of the book lies in the fact that Luhmann is no mourner for the loss of Bildung. He lets us rummage about in the garbage which may well be all we have ʻnach Auschwitzʼ. Once art becomes autonomous the emphasis shifts from self-reference to hetero-reference – which is not the same as self-isolation … but there is no such thing as self-reference without hetero-reference. (p. 149) When Luhmann claims that ʻpaintings acquire representative functions that are not confused with ordinary social reality, even though they refer to reality in a manner that implies both proximity and distanceʼ, it is as if he is referring reﬂexively to his own writing methods. The reader struggles to tell whether he is talking about the art system or his own system. In giving up the struggle and somehow conﬂating resources with subject matter we become enmeshed in the implications of proximity and distance on the boundaries of his or our own self-critical system. According to Luhmann, ʻWhen Hegel speaks of the end of art … he can mean only one thing: art has lost its immediate relation to society and worldly affairs and must henceforth acknowledge its own differentiation.ʼ He goes on to say that ʻthe differentiation of the art system … allows the relation between system and environment to be reintroduced into the system in the form of a relationship between self-reference and hetero-reference.ʼ He summarizes the implications of this as follows: ʻHow can the self be indicated if it excludes nothing?ʼ Thatʼs the point of our practice of describing and re-describing – i.e. of attempting to generate hetero-reference or, under another description, dialogic aura. Thatʼs the way it works. This is a way that art can be integrated into the everyday: by accepting, describing and redescribing its own differentiation as form. Attempts to deny this differentiation collapse art into the media space of journalism and render it the passive client to the barbarism of publicity. Art that has been asked no internal technical questions, that possesses no internal complexity, has no reﬂexive entity and thus nothing to differentiate. As a result, it can be put to any use or none. This almost always means that it is co-opted to the ideological interests which capitalʼs various academies represent. When a work of art is determined to call art as such into question, when, inspired by Gödel, it tries to appear as a work of art outside of the system of art, or when it seeks to accomplish a re-entry of non art into art in the sense of Spencer-Brown and, in so doing, generates an endless oscillation between inside and outside in an imaginary realm outside the calculus of forms – when all this makes up the intended meaning of the work and can be observed accordingly – then the art system has deﬁnitely arrived at a new level of self-description. (p. 293) Luhmann goes on to say that this is an attempt ʻto press the system to the limit so as to include the excludedʼ. Moreover, ʻhow is this possible socially, if not on the basis of autonomy – even when autonomy is practised as the renunciation of autonomy?ʼ Art of this kind no longer offers representations of oppositional utopias. Instead, it offers novelty as a provocation of society, and it is required to come up with ever newer provocations, until society becomes used to the tactic and fails to respond. This kind of art, Luhmann notes, ʻis no longer possibleʼ. Thatʼs very like what Greenberg and Fried thought in the 1960s. And they would all be right if it were not for the invention of a new kind of creature – a new kind of ʻcommunicationʼ: the curator for whom representation holds no interest. Representation has been supplanted by the presentation of distributed spectacle. This is ofﬁcial culture under the ʻhegemony of the law of noveltyʼ. But if this isnʼt possible, what is possible? Luhmann sort-of knows. ʻWhat counts is a performative contradiction, a “deconstruction” that turns back upon itself.ʼ (Memories of Paul de Man?) ʻThe self-negation of art is realized at the level of autopoietic operations in the form of art, so that art can continue.ʼ The selfdescription of a system is a paradoxical undertaking from its very beginning, because such a descriptionʼs operation includes both self-reference and heteroreference. In the end, the artist has to reﬂect these problems in objects that are constructed – made. In this connection, Luhmann reanimates (even though he doesnʼt quote) Barnett Newmanʼs smart-assed observation, ʻAesthetics is for artists as ornithology is for birds.ʼ And the artist still has to face this possibility: ʻIf anything is possible, then the criteria for selecting what is admissible must be tightened.ʼ Luhmann says that ʻOperative closure, the emancipation of contingency, self-organization, poly-contextuality, the hyper-complexity of self-descriptions or, simpler and less accurately formulated, pluralism, relativism and historicism – all of these trends offer no more than different cross sections of the structural fate of modernity. By suffering its own condition, art shows just how it is.ʼ The question still is, how might the tightening be done? Luhmann commends Art & Language a bit as redescribers. He ends his book with the tag from Virgil: Hoc opus hic labor est. (Artʼs hard work…) We conjoin our own, also from Virgil: …Quaeque ipse miserrima vidi. Et quorum pars magna fui (…and the most miserable things which I myself saw and of which I was a major part. Aeneid Book 2, 1.5). The reasons we have for continuing differ little from the reasons weʼd have for giving up.